Editor's note: I left off the VDP.ALL-CAPS verbiage, such as VDP.GROSSE LAGE, VDP.ORTSWEIN, and so on, to keep the text clean. For more on the VDP classification model, see my article on May 25, 2015. After a sneak peak of every new vintage at ProWein in Düsseldorf each March, the VDP's Mainzer Weinbörse, which takes place in April, is perhaps the best and most crowded professional wine event in Germany to taste the fruits of the previous autumn. Held at the Rheingoldhalle, which is attached to the Hilton along the Rhine River in Mainz, VDP.Weinbörse is a great two-day wine exchange with over 180 VDP producers from all of Germany’s wine regions. I have been going to the Weinbörse for the last eight years and this year decided to focus on the Mosel, and its tributaries the Saar and Ruwer. It was still a bit early in the game, so you will notice that several producers of the Grosser Ring – VDP Mosel-Saar-Ruwer showed only 2013s or just a few 2014s. As for the 2014 vintage, I won’t give you an in-depth report, as others have already done so, and this short article is more about sharing with you tasting notes on specific wines. The 2014 vintage definitely continues the string of high-quality vintages across the region. It shares a lot of the characteristics of the 2013 vintage, perhaps not hitting as many highs, but with fewer lows as well. In general, the acidity levels were slightly lower in 2014 than in 2013, while the dry-extract levels were higher, buffering the acid structure, providing smoother wines out of the gate, and hopefully reducing the temptation to de-acidify. The biggest successes of 2014 tended to be from feinherb (off-dry) to the slightly sweeter Kabinetts through to lighter Spätlesen, as some of the trocken, or really dry, wines could be a bit austere, outside of the top producers. Additionally, it was difficult to get the ripeness and concentration to make bigger Spätlesen and true Auslesen, with some exceptions, of course. This is the reason we need to taste so many wines, even if there is never a need for an excuse to taste more Riesling. 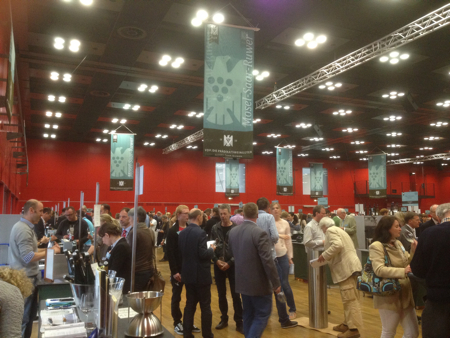 Heymann-Löwenstein, S.A. Prum, and Clemens Busch all showed 2013s, so I have not included them in my report. I did a slight detour during my tasting, though, and must mention that Clemens Busch’s 2013s were showing magnificently. Similarly, Van Volxem showed a couple of 2014s, but not really unfurling the new vintage until its presentation in August. As usual, Egon Müller, J.J. Prüm, and Willi Schaefer did not attend the tasting in Mainz, but I was fortunate enough to taste a few of Willi Schaefer’s wines at Mythos Mosel on May 29 and 30. These included a delicious Graacher Riesling trocken and feinherb up to an incredible Graacher Domprobst Auslese (AP 11), one of the best Auslesen of the vintage. It showed like an endless laser beam. Dr. Fischer – Bocksteinhof (Ockfen) had dry wines that were not to my taste, but I definitely turned a corner with their Saarburger Riesling feinherb Alte Reben (old vines) with its taut structure and fine minerality, as well as the Ockfener Bockstein Riesling Kabinett, which was peachy and had perfect weight, if a bit on the sweet side. Forstmeister Geltz Zilliken (Saarburg) had better success with dry wines from a quaffable Zilliken Riesling trocken to a more serious golden-apple crested Saarburg Riesling trocken to a firmer and more brooding, with plums, Saarburg Riesling trocken Alte Reben. As one would expect with its pedigree, the Rausch Riesling Kabinett was a big step above the Saarburg Riesling Kabinett (which also comes from Rausch but is only given the village designation). The Rausch Kabinett had a great mandarin tanginess and length. Both are thrilling wines for fans of Kabinetts of the late 1980s and early 1990s, even if the residual sugar is much higher now. The Rausch Riesling Spätlese was showing well and not that sweet, with great acidity, bright mango, and filigree. A tight and clean Rausch Riesling Auslese needed time to open up and was good, if not glorious, as many Zilliken Auslesen have been over the years. Von Hövel (Konz-Oberemmel) had many successful wines, particularly at the Kabinett level. The fine and floral Saar Riesling trocken was my favorite of their basic wines and should be a great value to be sought after in many markets. The von Hövel Riesling Kabinett was fruity and direct, saying take me now with pleasure, while the Hütte Riesling Kabinett had more weight and definition simultaneously, still being light enough on its feet to dance the night away. As expected, the Scharzhofberg Riesling Kabinett was tenser and firmer, with enough wet stone to skip across a lake. The Hütte Riesling Spätlese was decadently spicy, with marzipan, as well as being layered and long. It had a balanced sweetness and grip, certainly not one of the smaller Spätlesen of the vintage. I had more trouble with the Hörecker Riesling Spätlese Versteigerungswein (auction wine), but suspect this was more me than the wine. Reichsgraf von Kesselstatt (Morscheid) featured the Alte Reben Riesling trocken (Fassprobe, or cask/tank sample), which was lithe with grapefruit flavors, outperforming its rank, and the minty, fairly soft Kasel Riesling trocken. The Wiltingen Riesling trocken was spicier, almost salty and better balanced with integrated acidity. Von Kesselstatt’s feinherb wines were less dry than I remembered from previous vintages, and the best of the sweet wines was the Fassprobe of Josephshöfer Riesling Spätlese, which was showing some sponti notes, good minerality, and a nice fleshiness with more to come down the road. Peter Lauer (Ayl) had one of the most impressive lineups in the Saar or anywhere in Germany for that matter. The very basic and direct Ayl Riesling trocken (Fass 16) set the stage for the more distinctive and delightful cask, or Fass, numbers, even though most wines come from more than one cask or tank. Fass 6, also known as “Senior,” was steely, citrusy, assertive, and firm, while Fass 12, called Unterstenberg, had orchard fruits and was round, powerful, and long; it was sweeter but balanced. The Kupp Kabinett was juicy and concentrated, yet light on its feet, with a long, silky finish. Schloss Saarstein (Serrig) showed some nice wines. Of the dry ones, I preferred the chiseled Schloss Saarstein Riesling trocken Alte Reben, which was some of the driest wet stone that I have ever encountered with searing acid. The Schloss Saarsteiner Riesling Kabinett was on the drier side of fruity Kabinetts, medium-weight with white fruits and sea salt. Karthäuserhof (Trier-Eitelsbach) goes from strength to strength over the last decade with a fine range of everything from a very dry and finely focused Ruwer Riesling trocken to an ever finer and purer Schieferkristall Riesling Kabinett trocken, with great length and acidity. Meanwhile, the denser Alte Reben Riesling Spätlese trocken was playing the hiding game, but this should be great in time, too. The mouthwatering, almost sparkling Schieferkristall Riesling Kabinett feinherb could only be Ruwer and the Karthäuserhofberg Riesling Kabinett was a classic Kabinett, as well as perfectly weightless, which I preferred over the Karthäuserhofberg Riesling Spätlese, which seemed to have not as much energy. Fritz Haag (Brauneberg) had better so-called classic Pradikat wines than trocken and feinherb wines in my opinion. The Brauneberg Riesling Kabinett was a cherry beauty, with a sponti nose and a straight, steely style, along with a long and fine finish. Juffer Sonnenuhr Riesling Spätlese had notes of game and limes already and a firm, long structure. Juffer Sonnenuhr Riesling Auslese was all citrus and seamless, with class, if not a blockbuster. Schloss Lieser (Lieser) did fine work with their dry wines, everything from an edgy SL Riesling trocken that was more than a basic Gutswein to an even more intensely focused SL Riesling Kabinett trocken and a spicy, sponti SL Riesling Spätlese trocken with a rounder almost oily texture. It was the first vintage for the very smooth and slaty Wehlener Sonnenuhr Riesling Kabinett, while the Juffer Sonnenuhr Riesling Spätlese seemed earthy and rich in comparison. Willi Haag (Brauneberg) doesn’t draw as much attention as the other Haags (Fritz Haag and Schloss Lieser), but I really enjoyed several of his 2014s, particularly a sweet Willi Haag Riesling feinherb, a more complex and stony Juffer Kabinett feinherb, and a decadent, almost like sweet truffles Juffer-Sonnenuhr Riesling Spätlese. Dr. Loosen (Bernkastel-Kues) had a limited number of bottles open considering their extensive range, but showed a great, quaffable Dr. Loosen Blauschiefer Riesling trocken. as well as sweet and wet-earth Treppchen Riesling Kabinett (Fassprobe), and a classic, finely bred Wehlener Sonnenuhr Riesling Spätlese (Fassprobe). Nik Weis – St. Urbans-Hof (Leiwen) showed a steely, light yet savory Wiltingen Riesling feinherb Alte Reben, as well as a fantastic Saarfeilser Riesling feinherb, with almost jagged minerality and great palate presence. The tight and salty Bockstein Riesling Kabinett (Fassprobe) was the perfect foil to the golden raspberries of the lush Goldtröpfchen Riesling Kabinett.